Mr. Eric Sullivan holds the Easter basket he received from O.M.G. Club members as part of their Adopt-A-GP Community Service Initiative. Baton Rouge, LA – Many in South Louisiana celebrated the Easter weekend by attending church and spending time with their loved ones. The SU Ag Center partnered with Missy Radio, Addictive Strands, the Outstanding Mature Girlz Organization (OMG), Jessica Cain, and Cumulus Media to add to this heavily celebrated tradition. On Saturday, March 26, SU Ag Center’s Assistant Area Agent, Nicolette Gordon delivered Easter baskets to the St. Helena Parish Nursing Home. Eight baskets were sponsored by local businesses on behalf of OMG Club Members Chriterra Brumfield, Kyla Bryant, Symone Bryer, Shanika Holmes, Allanee Janeau, Kenneadei Lee, and Ariel Scott. These young ladies adopted grandparents at the nursing home last year to fulfill their community service commitment as members of the club. The baskets were filled with Palmers Lotion, Vaseline, Hand Sanitizer, Aloe Vera Socks, Crystal Globes, WXOK cups, and Gospel CD’s from various artists. “The baskets were just the right size for their aged, but wise hands,” said Gordon. Easter concluded the holiday visits to the St. Helena Parish Nursing Home for the Adopt-A-GP (grandparent) Community Service Initiative, but the SU Ag Center is gearing up for the 2016-2017 school year! For more information on how you can partner to enhance our Adopt-A-GP! Community Service Initiative, contact Nicolette Gordon in the Tangipahoa Parish Extension Office at 985.748.9381, or in the St. Helena Parish Extension Office at 225.222.4136. Baton Rouge, La. - Just in Time for National Garden Month: USDA Launches "Plant a Window Box for Pollinators" Using New People's Garden Initiative Website. On March 28, 2016, at the annual White House Easter Egg Roll, the United States Department of Agriculture (USDA) urged Americans of all ages to "Plant a Window Box for Pollinators" by using a new, free online tool available at the redesigned People's Garden Initiative website. Baton Rouge, La. - New Report from USDA's Agricultural Marketing Service Helps Communities Measure the Economic Benefits of Local Food Investments With Real-World Examples and Measurement Tactics. Agriculture Secretary Tom Vilsack has unveiled a new resource created by the U.S. Department of Agriculture (USDA) and Colorado State University that will help communities and businesses evaluate the economic benefits of investing in local food systems. The Secretary released details about " The Economics of Local Food Systems: A Toolkit to Guide Community Discussions, Assessments and Choices" in his keynote remarks at the 12th Annual Good Food Festival and Conference in Chicago. "Strong local and regional food systems are helping to revitalize rural and urban communities across the country, and more than 160,000 farmers and ranchers nationwide are tapping into growing consumer demand for locally grown products. With USDA support, this sector is increasing access to healthy foods for local residents and creating opportunity for small businesses that store, process, market and distribute food," said Vilsack. "Now community leaders have a toolkit that can help measure job creation and other economic development indicators, which will help make the case for continued investments." For more detail, visit USDA at http://1.usa.gov/1qfcfKE. Baton Rouge, LA – Over 300 small business owners, contracts, non-profit organizations, government agencies and prime companies converged on the Smith-Brown Memorial Union on March 22 for the Center for Rural and Small Business Development at the Southern University Ag Center’s 12th Annual Connecting Businesses with Contracts Procurement Conference. The event was co-hosted by the U. S. Small Business Administration, Louisiana Procurement Technical Assistance Center (PTAC), Louisiana Economic Development, Louisiana Small Business Development Center at Southern University and the Goodwork Network. Participants were able to network with each other and attended workshops on the topics of: tax reduction strategies, protecting business assets and six figure retirement planning; understanding state purchasing procedures; increasing the potential of success for your businesses; obtaining and keeping your contractor’s license; how the bank reviews/assesses your financial statements, making your decisions based on financial statements and a panel discussion on federal contract opportunities that are available and how to secure these contracts. A luncheon was also held during the conference that featured a panel of entrepreneurs who discussed how they began their businesses, the challenges they faced as start-up companies and how they found funding. Panel members Lizette Gordon with Carousel Medical Equipment, LLC; Alvinette Teal with Jesco Environmental and Geotechnical Services, Inc. and Danny Blanks and James Washington with Ponchatrain Partner, LLC, also shared words of wisdom with their fellow small business owners. This year’s conference kicked off with a business to business networking session on March 21 in the Smith-Brown Memorial Union. For additional information about the SU Ag Center’s Center for Rural and Small Business Development Center, visit www.crsbd.com or call 225.771.2242. 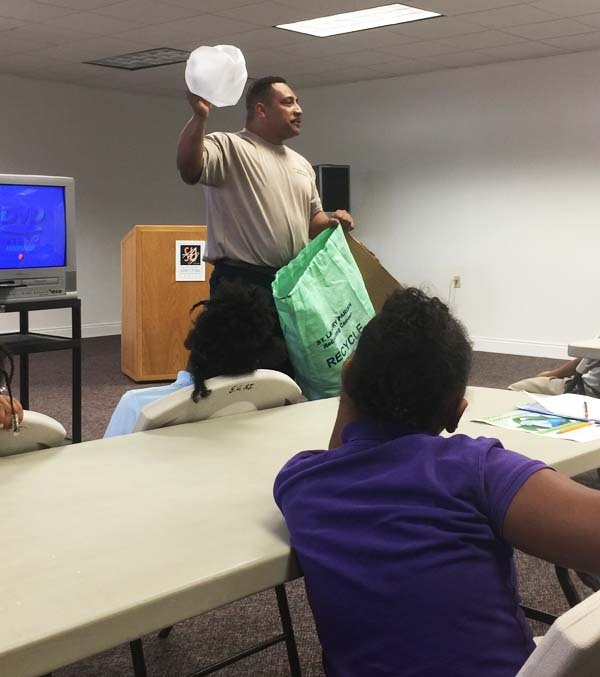 OPELOUSAS, LA – On Tuesday, March 15, 2016 the Southwest Center for Rural Initiatives celebrated National Ag Day themed “Agriculture: Stewards of a Healthy Planet.” Mike Guidry of the St. Landry Parish-Opelousas Recycling Center facilitated an enrichment on the importance of recycling to students in the Youth Educational Support after-school program. 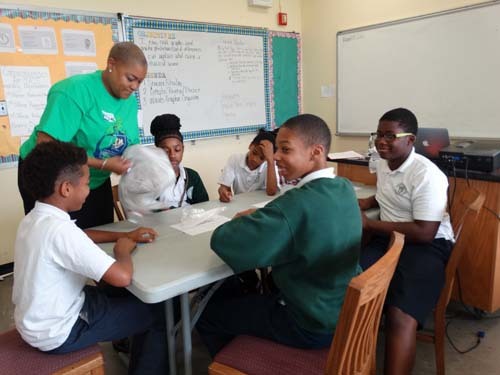 Participants gained knowledge on their role and responsibility to maintain and care for our planet, while also learning about the many ways recycled materials are utilized in sustainable agriculture. 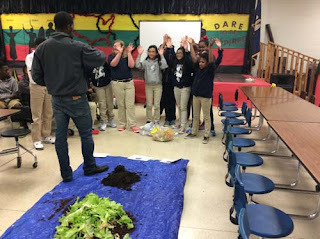 “From making compost to learning that they can make money from recycling goods (cans, bottles, etc. ), the students really enjoyed learning about recycling on National Ag Day,” said event organizer, Krystle J. Washington. 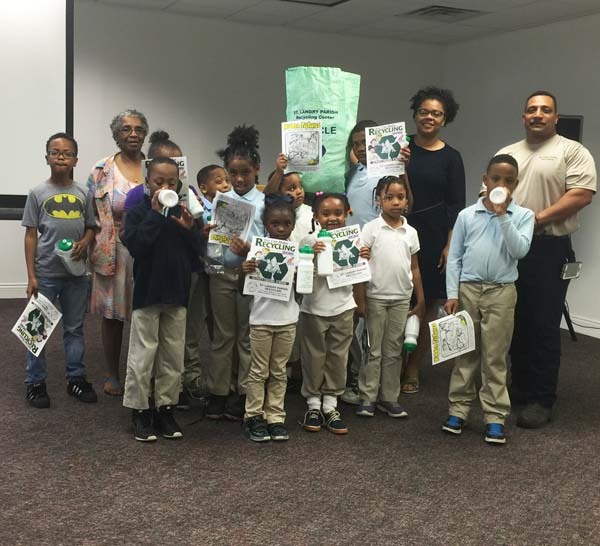 Many students also committed to begin recycling and encouraging others in their households and communities to do the same. To view pictures from the event, visit the #SUAGDay2016 tag on Instagram. Baton Rouge, La. - The SU Ag Center is celebrating National Ag Day today across the state. The theme for this year’s NAD is “Stewards of a Healthy Planet.” Youth and adults across Louisiana are engaged in agricultural activities throughout the day at various schools and community events. As agriculture professionals, we are Stewards of a Healthy Planet —a future for people, animals and nature. 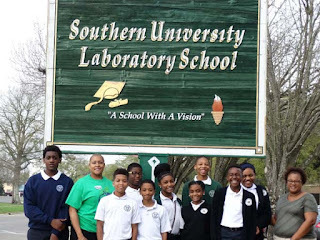 SU Lab School seventh graders participated in the 2016 National Ag Day event hosted by Southern University Agricultural Research and Extension Center. Today’s activities centered on composting for a healthier soil and environment. Janana Snowden; Mila Berhane; Stephanie Elwood; De’Shoin York; Chris Chappell, Photo Contest Chair; and Marlin Ford. Baton Rouge, La. 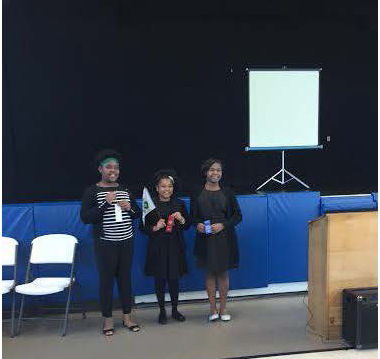 – The Orleans Parish 4-H youth program held its first local public speaking contest on Saturday February 27th. 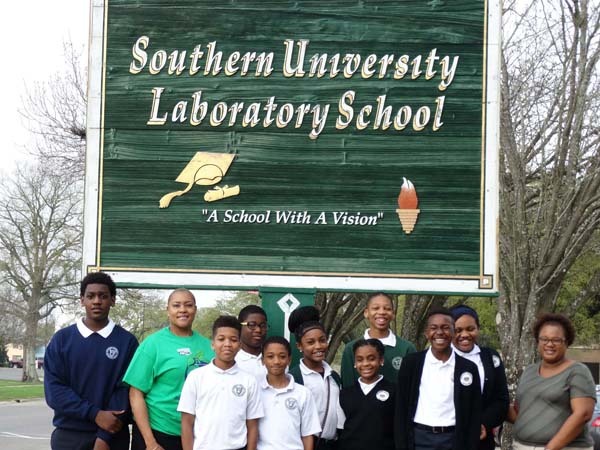 The public speaking contest is held locally to prepare youth to compete in the Statewide Public Speaking Contest at Southern University’s Youth Expo in Baton Rouge. All youth contestants were judged on General Appearance, Voice Control, Organization of Content and Overall Quality of Speech. The Public Speaking Topic was: “My 4-H experience: What 4-H means to me”. Youth were also asked to come dressed in Professional Attire. The Public Speaking Judging panelist included Mrs. Butler, Ms. Miller and Mrs. Gordon. Mrs. Butler has 21 years of experience in education and has 7 years of experience as a motivational speaker. Ms. Miller is a junior leader and has been a 4-H member for 4 years. Mrs. Gordon is the owner of Missy Radio station and a 4-H Youth Development Agent for Southern University’s Ag Center. She also has 17 years of experience working in youth development. Overall, youth enjoyed the public speaking contest and when asked, contestants all felt confident that they would be ready to compete in the Statewide Public Speaking Competitions. 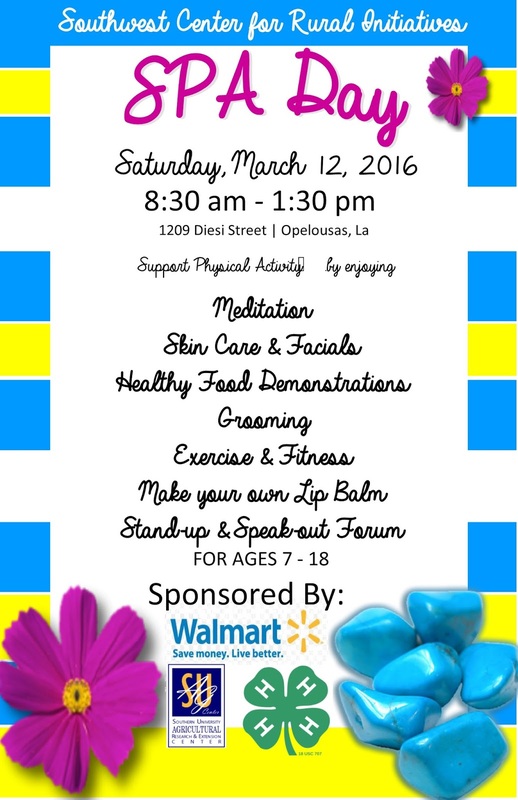 Baton Rouge, La, - The Southwest Center for Rural Initiatives will present Supporting Physical Activities (SPA) Healthy Living Program for Girls and Boys on March 12 from 8:30 a.m. to 1:30 p.m. at 1209 Diesi St. in Opelousas. Do you want to make living healthy fun for youth in the community? The center's “S.P.A. Healthy Lifestyles” is doing just that. SPA is an educational program aimed at helping youth find new alternatives towards achieving a healthy lifestyle. This program will offer the following workshops: Fitness Workout; Preparing and Eating Healthy Foods; Having a SPA Day for the girls (facials, manicures, etc. ); Etiquette; Grooming and skin care for boys; Stand-Up and Speak-Out Forum; Making a NATURAL lip balm, etc. This free program is open to all youth between the ages 7 to 18. Registration is limited and required for event participation to help with proper preparation. 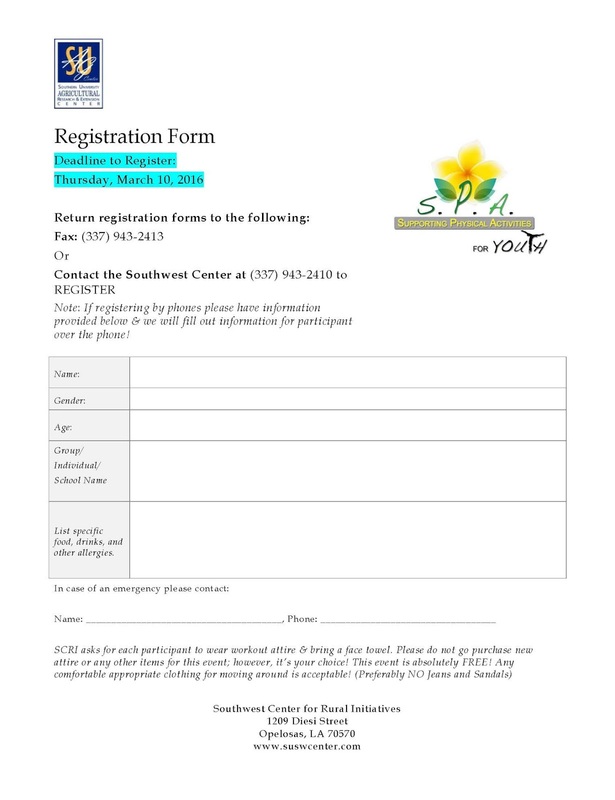 The deadline to register is Thursday, March 10, 2016. 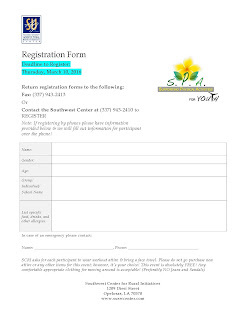 To register, contact The Southwest Center at 337-943-2410. 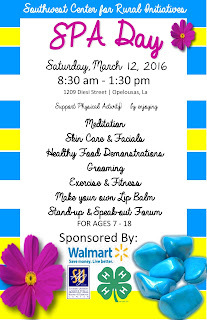 All participants must bring workout attire, and be ready to have a SPA Day experience! Parents are welcome to stay and have fun too. 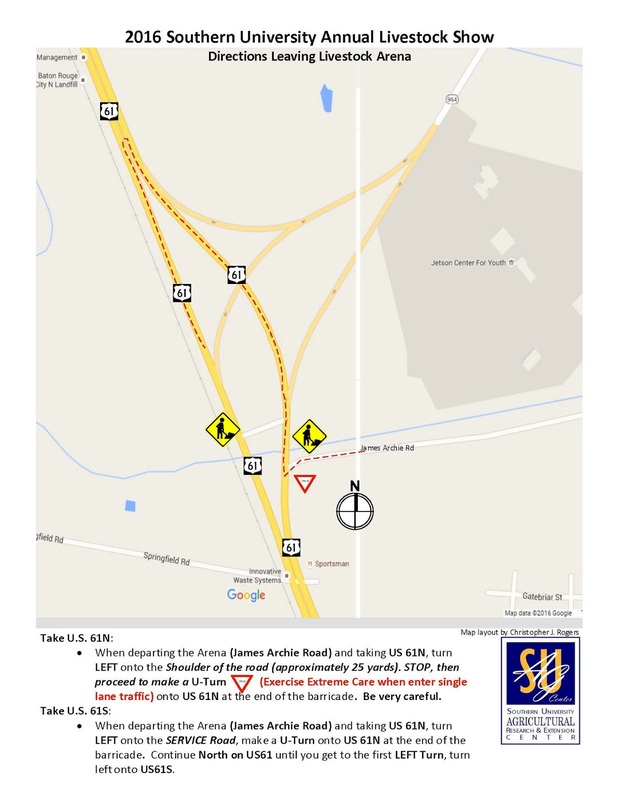 Baton Rouge, LA – Exhibitor and supporter of the Southern University Ag Center’s 73rd annual State Livestock Show, which will be held March 3-5, are asked to use extreme caution entering and exiting the show due to road work taking place on US 61 North, near the entrance to the Maurice A. Edmond Livestock Arena located on 14600 Old Scenic Hwy. Exit onto James C. Archie Road (on the right) directly past the Texaco station. When leaving the arena via US 61 N, go North through the construction site. Take US 61 N, turn left onto the shoulder of the road (approximately 25 yards). STOP, then proceed to make a U-Turn (Exercise Extreme Care when entering single lane traffic) onto US 61 N at the end of the barricades. 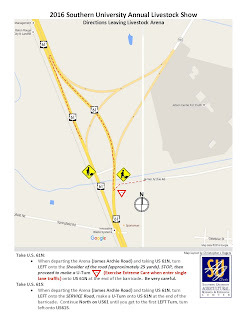 Take US 61 N, turn left onto the Service Road making a U-Turn onto US 61 N at the end of the barricades. Continue North on US 61 until you get to the first left turn. Make a left onto US 61 S.
For questions or additional information, contact the Livestock Show Office at 225.771.3510.